Forest 500 ranks the forest-risk commodity policies of the most influential companies and financial institutions acting in the global palm oil, soy, cattle and timber supply chains. Their rank is dependent on their commitments and actions towards ending forest loss in their supply chains or portfolios. Of the 350 companies assessed, 164 have committed to ambitious targets to reduce deforestation by 2020, in line with the goals set by the New York Declaration on Forests (Goal 2) and by the Consumer Goods Forum. Worryingly, many of these companies do not appear to be implementing them across their supply chains. Over 40% of the Forest 500 are still yet to make commitments to tackle the deforestation that they are linked to. The number of companies with commitments to address deforestation have steadily increased since Forest 500 began tracking company policies in 2014. 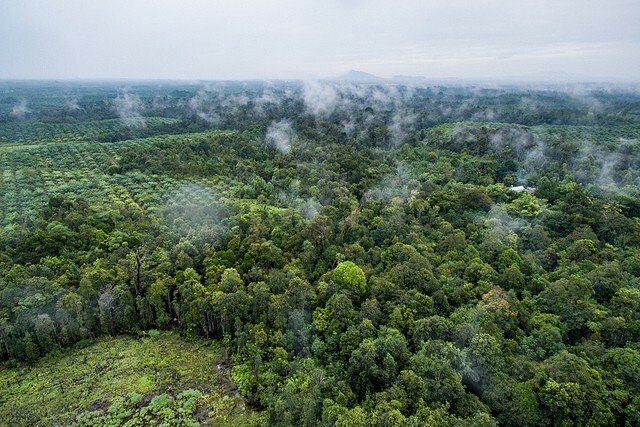 Now 57% of companies have a commitment to protect forests for at least one of the commodities they are exposed to on the final stretch towards 2020. The assessment focuses on ‘forest-related’ commitments to recognise the efforts of companies that look beyond broader sustainability commitments and focus on protecting priority forests and/or eliminating deforestation completely within their supply chains. Commitments continue to push further with ambition moving beyond reducing deforestation to zero conversion of forests such as Cargill’s commitment to sustainable soy, announced after the 2018 assessment was completed. This is an encouraging step in the right direction, but depends on their promise of a time-bound action plan. But the most influential companies must take action to ensure that their commitments are implemented. So in 2018, we introduced five implementation indicators to assess key actions that companies should be making to implement their commitments. They reflect the urgent need for powerbrokers to take action towards reducing deforestation in their supply chains. Forest 500 has identified that in total only 50 of the companies assessed in 2018 reported on some implementation activities for all of the commodities they are exposed to. And almost a third of commodity-specific forest-related commitments made by companies did not include any implementation actions for any of the five indicators. ● Companies active in palm oil supply chains have the highest proportion of implementation indicators with forest-related commitments, with 12 companies scoring for all five. ● The highest percentage of companies with no implementation indicators across the commodities are in paper supply chains (41%). However, there are examples of best practices for paper companies to learn from with Nestle reporting on implementation actions on all new indicators. ● Soy and cattle are two crucial forest-risk commodities that continue to lack in commitments year on year. This itself is worrying, but what emerges when we look at how the few existing commitments are being implemented? ● The 2018 assessment shows that no soy companies disclose their direct suppliers. This reflects an overall pattern of there being a significant implementation gap within soy supply chains. ● It is promising to see a high proportion of cattle companies reporting on their collaborations with other stakeholders in reducing deforestation such as the Leather Working Group. The cattle supply chain is complex and collaboration isa way of bringing together its different actors to reduce deforestation on the ground. This finding could show how they are taking steps to do so. As the 2020 deadline is missed, efforts beyond that need to rally around the implementation of zero-deforestation commitments. The number of companies yet to make commitments must also be urgently addressed with commodity production being one of the largest drivers of global forest loss. The 151 companies who have dropped scores in 2018 need to take action. 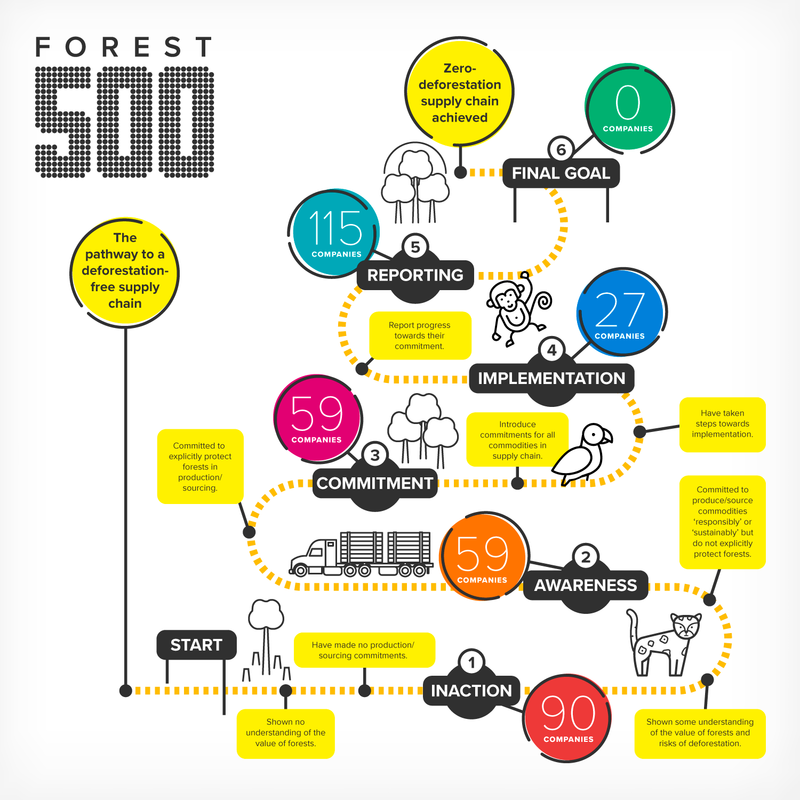 For those already taking these steps, the improved Forest 500 methodology now identifies the companies leading the way on implementation. We want to encourage them to continue on this pathway and to motivate others to join them in implementing their commitments. Forest 500 recommends that companies learn from their experience over the last few years, and from the successes of leaders in these supply chains, by putting time-bound action plans for implementation in place. It is crucial that this is done without reducing ambition. There needs to see a sector-wider shift towards the implementation of commitments if we are going to see commodity-driven deforestation begin to slow down.